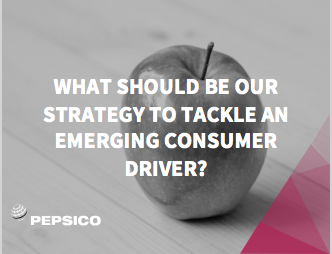 AFTER REFRAMING THE INITIAL QUESTION TO FOCUS ON DEODORISING RATHER THAN DEODORANTS, WE FORGED TOGETHER DATASETS, INSIGHT REPORTS, TECHNICAL ROADMAPS AND TRENDS TO CREATE A STRATEGIC FRAMEWORK FOR THE FUTURE OF THE CATEGORY AND A ROADMAP OF COMMERCIAL OPPORTUNITIES. WE DEVELOPED A MARKET MAP OF THE SECTOR SHOWING WHERE KEY LOSSES WERE BEING MADE & WHAT CATEGORIES WERE BEING IMPACTED . WE THEN FORGED TOGETHER 3 YEARS OF EPOS DATA WITH OTHER SOURCES TO ILLUSTRATE THE CURRENT OWN LABEL BRAND PERFORMANCE BEFORE BUILDING A NEW OWN LABEL ARCHITECTURE & STRATEGY. WE CONDUCTED A REVIEW OF EXISTING DOCUMENTS & FRESH MARKET SCOPING TO UNDERSTAND HOW BRANDS & PRODUCTS ARE OPERATING IN THE WORLD OF PERMISSIBILITY & WHAT THE GENUINE BREADTH OF THE NEW OPPORTUNITIES COULD BE IN ORDER TO DEVELOP ‘WHERE TO PLAY’ AND ‘HOW TO PLAY’ FRAMEWORKS INFORM STRATEGIC PORTFOLIO DECISION MAKING. 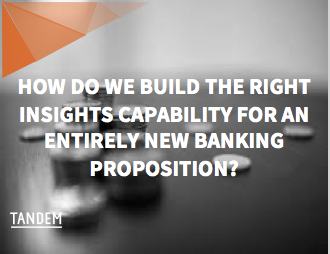 HOW DO YOU SET UP AN INSIGHT FUNCTION FOR A START-UP WANTING TO DO SOMETHING COMPLETELY DIFFERENT IN THE CATEGORY KNOWING THAT EXISTING APPROACHES, STRUCTURES & DATASETS ARE UNSUITABLE? WE WORKED WITH THE TEAM AT TANDEM TO ESTABLISH EXACTLY WHAT THE BUSINESS NEEDED TO ACHIEVE ITS AIMS AND HOW TO GET THAT INFORMATION & INSIGHT TO THE RIGHT PEOPLE AT THE RIGHT TIME. THERE IS A DIFFERENCE BETWEEN LOVING A BRAND AND LOVING A PRODUCT AND THIS WAS CAUSING CONFUSION WHEN LOOKING AT THE QUANT DATA. WE EXPLORED THE BRAND, PRODUCTS & COMPETITORS THROUGH THE EYES OF CONSUMERS IN FOCUS GROUPS & CONDUCTED A THOROUGH SOCIAL MEDIA EVALUATION TO UNDERSTAND SENTIMENT & BRAND PERCEPTIONS, & ANALYSED KEY INFLUENCER PERCEPTIONS. THIS GAVE THE TEAM ENOUGH EVIDENCE TO CHALLENGE THE BRAND METRICS & INVEST IN THE RIGHT BRAND EQUITIES GOING FORWARD. THE CHALLENGE WAS TO MAKE PEOPLE WANT TO DECORATE AGAIN BUT THIS IS NOT AN ISSUE THAT CONSUMERS CAN SELF-DIAGNOSE, THE RESEARCH NEEDED TO BE SHAPED TO UNDERSTAND HOW TO DRIVE THE REQUIRED BEHAVIOURS. WE CONDUCTED DEEP BEHAVIOURAL ANALYSIS OF WHAT IGNITES PEOPLES PASSIONS VIA BESPOKE ONLINE COMMUNITIES, AND UNDERTOOK ANALYSIS & IDENTIFICATION OF KEY INFLUENCERS WHO WE COULD LEVERAGE FOR SUPPORT. THE RESULT WAS A SHIFT IN MARKETING INVESTMENT, A NEW COMMS STRATEGY AND THE DEVELOPMENT OF AN INFLUENCER PROGRAMME. OUR CLIENT WANTED TO UNDERSTAND THE UNDERLYING PRINCIPLES THAT GUIDED THE ACTIONS OF A KEY COMPETITOR SO THAT THEY COULD BETTER ANTICIPATE AND RESPOND TO THE COMPETITIVE THREAT. WE FORGED TOGETHER HUNDREDS OF RESEARCH DOCUMENTS, DESK RESEARCH AND MARKET DATA TO CREATE A FRAMEWORK FOR UNDERSTANDING. A KEY INSIGHT ABOUT THE COMPETITOR'S FOCUS LED TO A FUNDAMENTAL CHANGE IN THE WAY UNILEVER EMPLOYEES ARE BONUSED. THE CHALLENGE HERE WAS TO CREATE DESIRE FOR A VERY TRADITIONAL PRODUCT AMONGST A NEW GENERATION OF CONSUMER WHILE NOT ALIENATING AN OLDER AUDIENCE. WE FORGED TOGETHER EXISTING RESEARCH TO CREATE HYPOTHESES FOR GROWTH THAT WERE EXPLORED IN WORKING SESSIONS WITH THE PROJECT TEAM BEFORE CREATING AN INSIGHT BIBLE TO INFORM THE NEW BRAND POSITIONING. IN ORDER TO EVOLVE THE BRAND WE NEEDED TO BROADEN THE HORIZONS. WE FORGED CONSUMER, TECHNICAL, CUSTOMER & BRAND DATA & INFO TO IDENTIFY 5 INNOVATION OPPORTUNITY TERRITORIES THEN USED MULTI-MARKET CONSUMER DEEP DIVES & SEMIOTICS BEFORE MOVING INTO CONSUMER CO-CREATION AND IDEA EXPLORATION TO CREATE A PIPELINE OF IDEAS THAT CAN MOVE CONSUMER VIEWS OF THE BRAND FORWARD . INNOVATION IN THE BUSINESS HAD BEEN DEVOLVED TO CATEGORY TEAMS RESULTING IN AN INCOHERENT PRODUCT STORY THAT DIDN'T SUPPORT THE OVERALL AMBITIONS OF THE BRAND. WE FIRSTLY WORKED WITH THE BRAND TEAM TO REFINE THE INNOVATION STRATEGY, ONE THAT WOULD SUPPORT AND BE SUPPORTED BY THE TESCO BRAND. WE THEN FORGED TOGETHER TRENDS, EPOS, QUAL AND QUANT RESEARCH REPORTS AND R&D INFORMATION TO CREATE A SERIES OF INNOVATION PLATFORMS TO FORM THE UNIFYING THREADS IN FUTURE NPD. THERE IS NOW A TESCO-WIDE MANDATE TO USE THESE PLATFORMS. THE PERSONAL CARE TEAM HAD BEEN WRESTLING WITH WHAT FRESHNESS REALLY MEANS TO CONSUMERS AND HOW IT COULD BE USED TO CREATE GROWTH IN PC CATEGORIES. PREVIOUS STUDIES HAD TRIED TO LADDER THE MEANING UP BUT THIS RESULTED IN IMPRACTICAL AND THEORETICAL DEFINITIONS. WE BROKE IT DOWN INTO 10 FRESHENING EXPERIENCES THAT CONSUMERS COULD RECOGNISE AND VALUE. 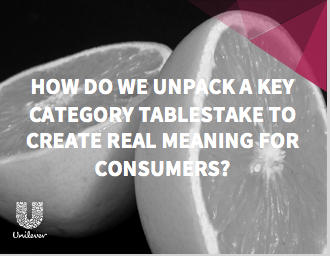 THIS FRAMEWORK NOW FORMS THE BASIS OF BRAND PLANNING, INNOVATION AND CATEGORY STRATEGIES ACROSS THE UNILEVER PERSONAL CARE BUSINESS. THIS CHALLENGE WAS BIGGER THAN ‘WHAT IS THE NEXT SHAMPOO’ AND NEEDED TO TAKE IN INSPIRATION FROM A WIDE RANGE OF SOURCES IN ORDER TO IDENTIFY GENUINELY DISRUPTIVE SPACES FOR THE TEAM TO GO AFTER. TO DO THIS WE FORGED TOGETHER EXISTING INSIGHTS, MACRO TRENDS & CULTURAL CONTEXT TO DEVELOP A FRAMEWORK OF INNOVATION PLATFORMS. THE RESULT WAS CLEARLY DEFINED & EVIDENCED INNOVATION PLATFORMS WITH SHORT & LONG TERM POTENTIAL WHICH FORM THE BASIS OF BRIEFS FOR CONSUMER CO-CREATION, R&D EXPLORATION AND BRAND PLANNING ACROSS THE CATEGORY. 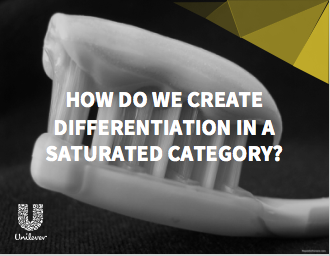 USING A FRAMEWORK WE HAD DEVELOPED FOR A CROSS-CATEGORY TEAM, WE CONDUCTED A DEEP DIVE FOR THE ORAL CARE CATEGORY, MAPPING THE CLIENT & COMPETITOR PROPOSITIONS TO UNDERSTAND WHERE THERE WAS WHITE SPACE & AN OPPORTUNITY TO NOT ONLY CREATE STANDOUT BUT ALSO MOVE THE WHOLE CATEGORY CONVERSATION ON. WE FORGED TOGETHER ACADEMIC INPUTS WITH EXPERT & CONSUMER INTERVIEWS TO CREATE A SET OF POWERFUL STORYTELLING GUIDELINES. ALONGSIDE THIS WE CONDUCTED A CONSUMER QUANT STUDY TO IDENTIFY THE ARCHETYPES FOR OVER 400 GLOBAL BRANDS & DISNEY ASSETS. THIS WAS THEN TRANSLATED INTO INTERNAL GUIDELINES, CONFERENCE MATERIALS AND A BRAND PARTNER IDENTIFICATION TOOL. AFTER A FULL COMMERCIAL REVIEW OF THE CATEGORY WE USED AN ONLINE COMMUNITY WITH PRODUCT PLACED MIDWAY THROUGH TO FORCE APPRAISAL AT KEY MOMENTS & THEN FOLLOWED UP WITH FOCUS GROUPS TO EXPLORE THE CATEGORY IN DETAIL. THIS GAVE US AN UNDERSTANDING OF THE CATEGORY SUCCESS FACTORS & A SET OF GUIDELINES FOR HOW A MAINSTREAM PROPOSITION NEEDED TO OPERATE IN THE CATEGORY TO WIN. POPWORKS HAS NOW BEEN LAUNCHED IN UK VERY SUCCESSFULLY!